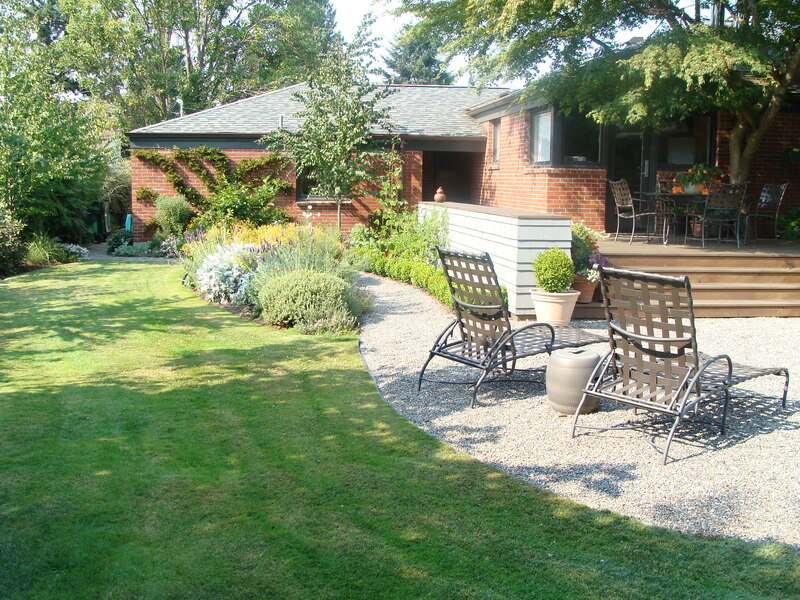 The design of this Wedgwood garden started with prudent site selection. When the clients, a couple newly transplanted from Palo Alto, looked for a Seattle home, they sought out a large, flat property at the top of a hill instead of a sloping lot with mountain views. 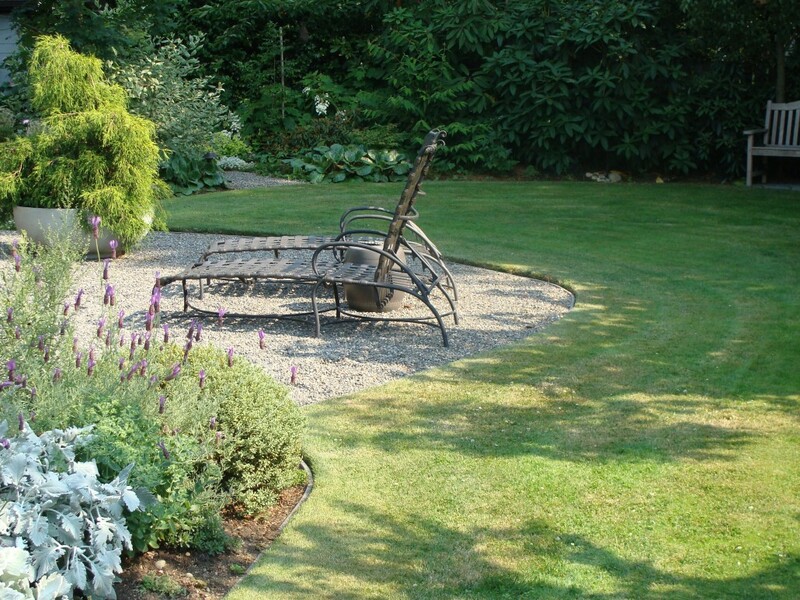 This decision in and of itself guaranteed that their garden would be sunny, pleasant and highly usable. The L-shaped brick house was extensively remodeled by architect Tom Lawrence but what was lacking was a large deck for outdoor entertaining. 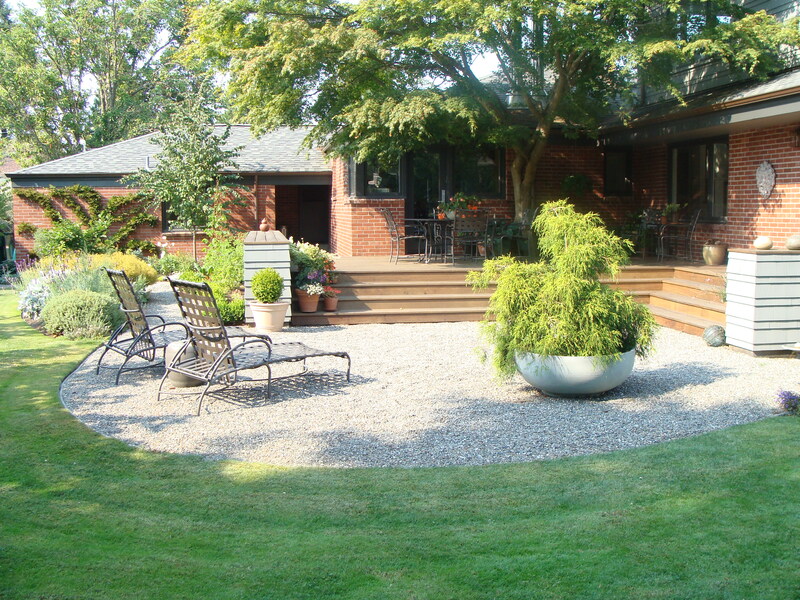 Thus it was no surprise that Seattle Landscape Architect Brooks Kolb proposed that the centerpiece of the garden design should be a large, ipe deck in the corner of the two wings of the house and at the main floor level, with four gentle steps down to a garden sunning terrace paved with pea gravel. 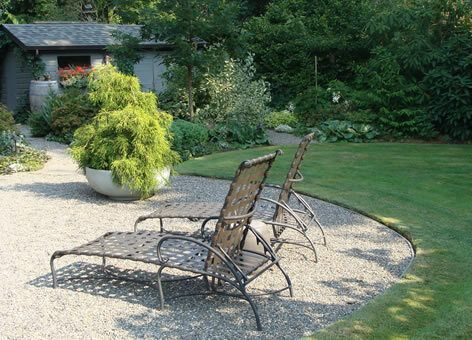 Carefully arranged with a cut-out to preserve a beautiful, large Japanese Maple and edged with ample shingle-covered seat walls, the deck was sized expressly to permit outdoor dining at ease. 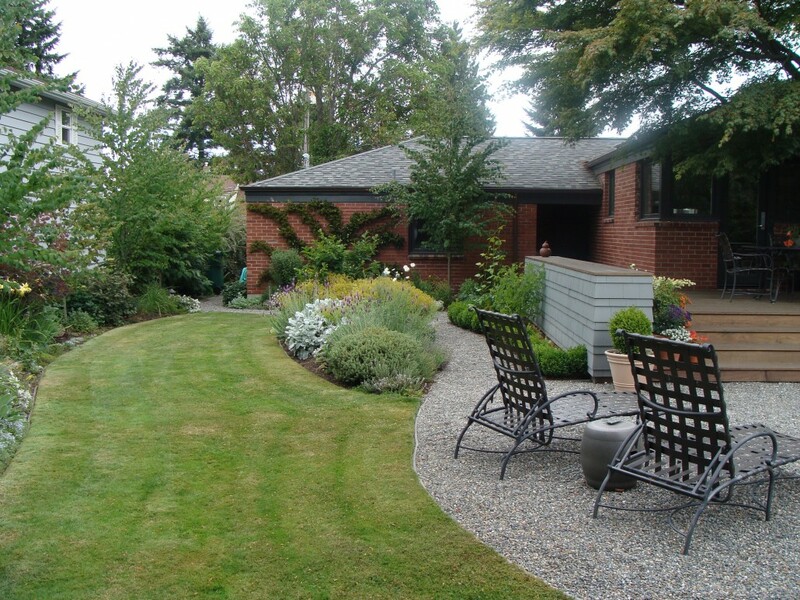 Then, to soften the angular lines which are always a feature of L-shaped buildings, Brooks designed a flowing lawn to wrap around the curve of the gravel terrace. 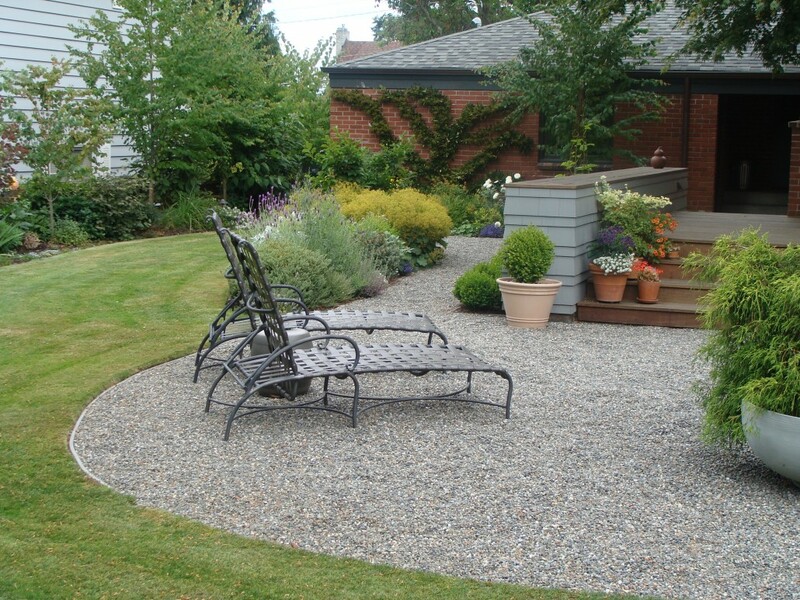 This contrast of rectilinear and curving lines was one of the key design contributions of the celebrated mid-century California landscape architect, Tommy Church, known locally for his design for Lakewold, a publicly accessible garden in Lakewood. 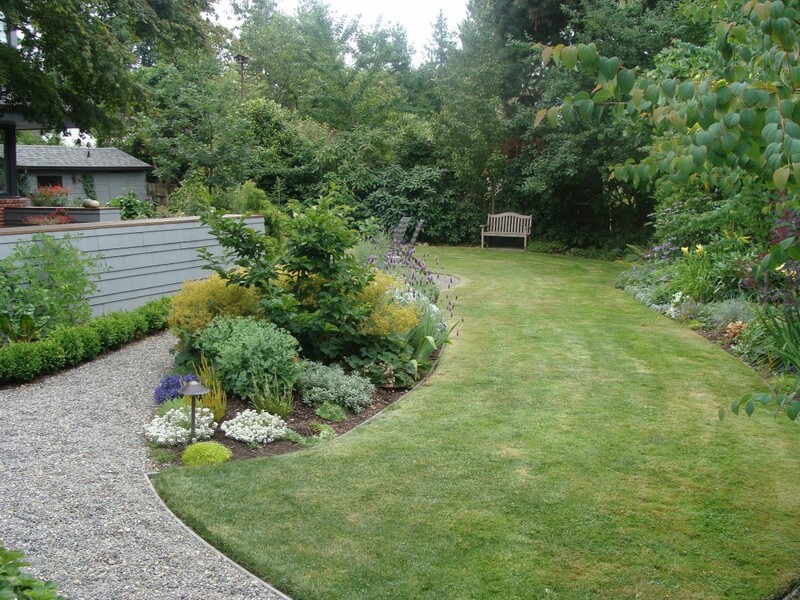 Since the clients are avid gardeners, the garden contains a few unusual plants along with many dependable stand-bys and features a large gravel-covered area for potting next to a garage which is now used as a garden shed. 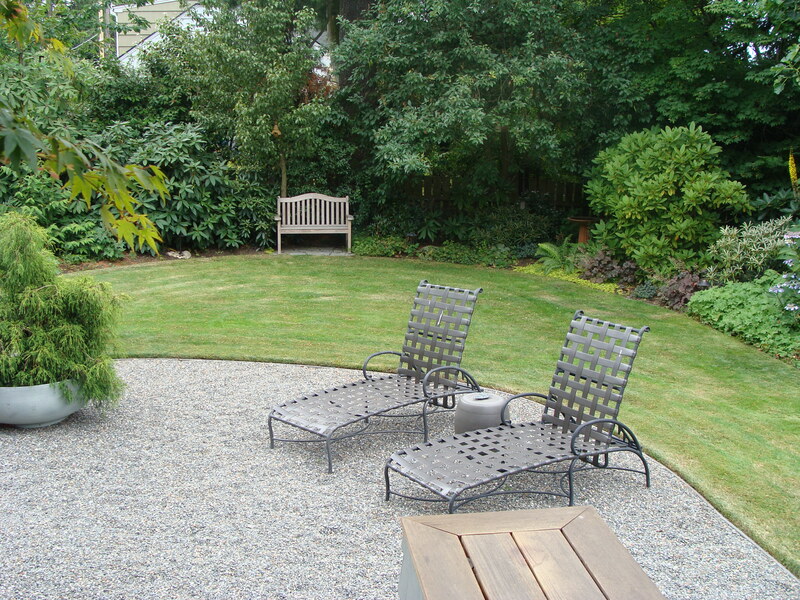 The center of the garden will become increasingly dominated over the years by a beautiful large Red Oak tree.